Nullifire was contracted to advise the engineers working on the Penrith Panthers Stadium upgrade about providing a fire rated coating that met both performance and design objectives. 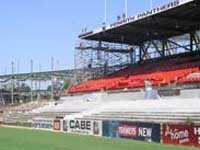 The upgrade project on the Penrith football stadium, the home ground of the mighty Penrith Panthers, involved the construction of a whole new wing. After the concrete had been laid and the steel formwork put in place, Nullifire was brought in to advise the engineers who required a 60-minute FRL as well as an aesthetically pleasing finish. Nullifire recommended the application of a fire retardant paint that would allow the contractors to use a finishing paint over it without affecting the overall design criteria. A thin film intumescent coating was applied to the steel. According to Nullifire's manager of Fire Rating, the application of a thin film intumescent over the more traditional methods achieved a dual purpose – the required 60-minute FRL was attained while a finish was also provided that allowed the contractor to choose a top coat for an aesthetically pleasing design outcome.